Available in short wheelbase (2755 mm) and long wheelbase (3105 mm) options. 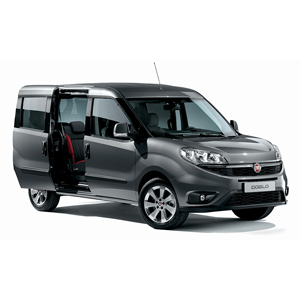 Up to 5 comfortable seats and a payload of 453 kg (363 kg with the short wheelbase). Load compartment capacity of up to 1050 litres (790 litres with the short wheelbase). Two rear door types: asymmetrical swing doors, or glazed The swing doors, available in a glazed version, are 123 cm wide, exactly in line with the width between wheel arches, and 125 cm high on the standard versions and 146 cm high on the high roof versions. Rear handle to allow easy opening of the swing doors for both right and left handed operation. Two large sliding side doors – 70 cm wide and 117 cm high – with the slide rail recessed in the vehicle body. Rear load threshold just 5 cm from the ground.